Good for you Jackie! I too am considering coming off of FB but I had not thought of Google+. try it out, P 🙂 Just poke around a bit. as someone who really IS old and crotchety…thanks for explaining all that in a way that made sense to me. Now that I can make an informed decision I will go away and consider my options..and probably forget what the h$%$ you were talking about. See? : Awkward. Maybe they’ll just make up a word. They seem to be good at that. I realized too late that FB is no place for an introvert…thx for a lesson in the alternative! Sure thing! I really love that with G+ you can share what you want with who you want. It’s refreshing. You know what’s a really unfortunate flaw in your plan though? Facebook makes it incredibly difficult TO GO THROUGH AND UNSUBSCRIBE FROM EVERY SINGLE FRIEND INDIVIDUALLY. Although doing so makes me hate Facebook even more. So that helps. just do it casually. when you’re scrolling down through your feed, just weed a few out here and there. eventually it will have to fill your feed with other folks and you’ll get a good rotation going. Good luck on your journey. Be sure to pack a little snack and some clean underwear. I’m on both right now, but I’m not really using Google+ yet. I didn’t realize that I could unsub from people without them knowing — ‘I have a little list, they’d none of them be missed’ (I probably misquoted). Perhaps I will go unsub them right now. I get way too much crap on Facebook anyway; I can’t see the posts of the people I really care about! of course, I’m not sure what the heck ‘the most important’ updates are.. I think this is a really sound plan and much less painful than the alternative of quitting FB cold turkey. Thanks for planting the seed on my next big technology switch over. I have grown a bit tired of the aggressive changes FB has been making. Toodles FB…tata for now! They are aggressive, aren’t they? I should have used that phrasing. Where were you when I was writing this post?! I’ve been on Google Plus for a week or so, and I like it better than Facebook, although there are far fewer people on G+ than FB…hopefully more people will make the transition. well isn’t your picture just lovely! I agree – the biggest downfall of G+ right now is just the strain of having some friends in one place and some in another. Pain in the tushie. This is my third day of no FB access whatsoever! I’m lucky in that my closest friends jumped to G+ immediately, so I’ve got my virtual circle if I need it… good luck with your plan! oh and I’m a new follower; love your style! Hi Mona, the New Follower. Welcome to the party. 🙂 Third day no FB, eh? Do you have the shakes yet or are you holding steady? Day 4: The shakes and cold sweats came early last night. I starting hearing voices in the walls, couldn’t be sure if it was the delusions or Zuck’s eyes and ears on the ground. I’m scared… but I’m holding out. They won’t take me alive!!! Erm, I’m doing well. Seriously. 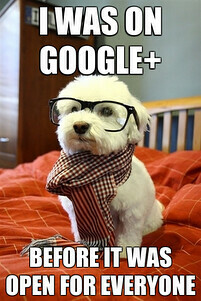 Been on Google+ before it was cool. Good luck on totally erasing everything you don’t on want facebook. They’re notorious about holding onto data that should have been gone. I like how you state you don’t hate change, just when there is a really big difference, and then state you changing to a completely different system 🙂 Is google+ any good? I’ve been considering checking it out but I’m not sure I want another social network to take up all of my time. I’m pretty sure I can’t abandon facebook though, I’m kinda addicted to it. How did they do that again? Fair observation 🙂 Google has a habit of announcing changes well before they’re implemented and allowing you to switch back and forth until you’re used to it before the rollout. I’m hoping they keep that up for G+. Also, it’s really the next step Fbook is taking that has me running scared from 1984. I like G+, personally. There isn’t much to learn, really – it’s what you expect. It’s like Fbook before things got all crazy. Wean yourself off the Fbook 😉 Every time someone comes up in your mini feed that you don’t care about, unsubscribe to them. Keep doing it once in a while until you boil it down and ask yourself if you’re really spending all that time on there just for them. If it’s worth it, awesome. If not, leeeeave. Hi Jackie! Really enjoyed your take on Google+. Makes me think I need to give it a serious try and get rid of Facebook, too. I’ve had a Google+ account for a while, but I didn’t understand why it was so much better or why I should put the effort into it until I read your post. Thanks! Oh, and I have a solution for your Facebook photo problem. Several months ago I wanted to download all of my photos from Facebook to my computer. I used a free program called PhotoGrabber. It’s kind of scary at first because it asks for your Facebook login info, but it is the only way and I’ve never had it infiltrate my Facebook. You can opt not to have it become a part of your Facebook life. It’s great. P.S. Just wanted to say I come from a geek/nerd family, too. My dad used to play D&D. When my sister and I were old enough to have similar interests and game-playing skills, he bought us HeroQuest. We spent many hours playing it. We also used to play a lot of the Lonely Mountain game (you quest for LOTR treasure in Smog’s lair). Love the link – thanks! And the spelling correction for Smaug – me thought you were a poser at first (jk). You are the only person I know that has ever mentioned that game in conversation. Ever. I…I… I have so much joy I don’t even know how to express it right now. Thank you so, so much.